This is a great craft to do in a classroom, preschool, day care or at home (like I did). 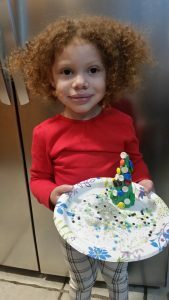 It’s also a great alternative to making tiny gingerbread houses, that some classes make during the holidays. It’s also a great way use old Halloween candy. 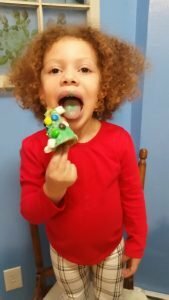 I made this ice cream cone Christmas tree with my almost 3 year-old and she had a blast. 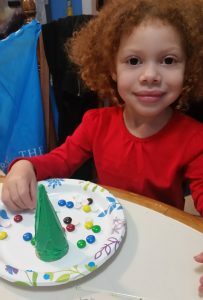 She wanted to make a whole forest. What I might do is make a gingerbread house, then make these ice cream cone trees to around the house for a winter scene. I also did this with my 12 year-old niece and her friends and they loved it too. I think this is a good craft to do with children of all ages. 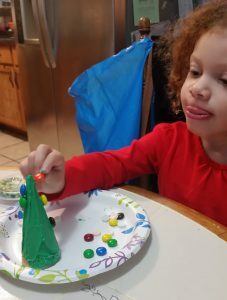 Follow the step-by-step directions below to make your very own ice cream cone Christmas tree. 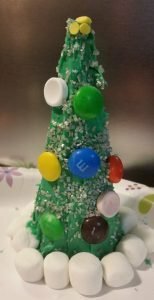 Materials: green frosting, sugar ice cream cone, things to decorate I used M&M’s and Smarties leftover from Halloween, marshmallows and sprinkles. You can also use things like coconut and any other small candies. 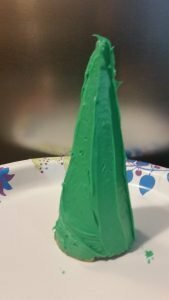 Step 1: Spread a thin layer of your green frosting over the entire ice cream cone. This is really the only step little kids will need help with. Everything else they can do on their own. Step 2: Start decorating. Place M&M’s, Smarties and any other small candies on your Christmas tree. My daughter wanted marshmallows on hers. Her marshmallows kept slipping off her tree, so we decided to put them on the bottom. We also used silver sprinkles to look like snow and yellow sprinkles on top for a star. My daughter wanted to try hers. I let her take 2 bites. There trees aren’t really for eating more as a decoration. They are super sweet, since it’s just frosting, sugar cone and candy. Thank you for visiting www.kidsplayandcreate.com. Happy Holidays!